The Marie Raos Ray White HPCC Premier Men resumed playing in the Hedley Howarth Two Day Major Championship and had the pleasure of meeting Cornwall for the third time this season. Skipper Walsh lost the toss and the local XI were invited to bat. Usually this is a good thing because the wickets play so well but this time there was more than a little green on the surface. The Cornwall bowlers were accurate and kept the pressure on all day and restricted the normally free flowing top order as wickets fell at about 20 run intervals. Dan Young produced a controlled innings to score 59 with Brian Barnard 32 and Dale Phillips 39 in support. After 63 overs, the Alpacas were dismissed for 204. However the local lads came out to determined to make up for their batting display and Matt McEwan soon had the openers back in the pavilion with the score standing at 25. After that Cornwall’s batsmen struggled to establish any partnerships and wickets fell about every 10 runs in face of unrelenting pressure from the home sides bowlers. McEwan took 3/14 off 12, Danru Ferns 3/34 off 11, Rudi Botadra dismissed Cornwall’s best batsman Dhadwal and took 2/21 off 7. Bill Walsh and Adam Jones chimed in with a wicket each. After only scoring 101, Cornwall were invited to follow on and put up determined resistance on a wicket the had evened out and was easier to bat on. Crooks held the innings together with 97 off 114 balls and in the end it took 57 overs to dismiss Cornwall for 206 with just over an hour to go. All the bowlers hung in there in spite of the energy-sapping heat with Jamie Brown 2/30, McEwan 2/38 and Donovan Grobbelaar 3/44 being the main wicket takers. Set 104 to win outright the Alpacas made hard work of it. After nearly two days in the field tiredness had begun to creep in. After only 8 overs Howick ‘s score was 31/4 and after the 5th wicket fell at 52, victory was looking just a little unlikely. However opener Bill Walsh had anchored himself at one end just ticking the score over when McEwan came to the wicket and, after settling himself in, took the attack to the bowlers, scoring 45* in 22 balls and Howick had won the match by five wickets. Bill Walsh also ended up undefeated after batting 113 minutes. This was the toughest match of the season and with the Howick lads in place on the table behind Suburbs, they are real title contenders. Howick Pakuranga Premier Women won a vital match against Takapuna to qualify for the semi-final in the Pearl Dawson T20 Trophy. Takapuna batted first and scored a moderate 91/9 in its 20 overs. All the bowlers turned in top performances with Josie Penfold 2/13 off four overs, Alyssa Bowden 2/13 and Auckland Skye Bowden 1/3 off three being the main wicket takers. The whole side was very sharp in the field with good returns and clean taking of the ball. Takapuna quickly had the local ladies in real trouble with three wickets falling for only 7 runs. However Tash van Tilburg and took control of the match. She was very composed in scoring her 55 runs and formed useful partnerships with Holly Topp and Lucy Western. With one over to go, Howick needed 7 runs and it was very tense on and off the field. However two wides and a Topp boundary saw the local lasses home at 92/5 in 19.4 overs. It couldn’t have been any closer but this win took Howick Pakuranga Women into its first ever major semi-final. The second match of the day was a bit of an anti-climax even though Howick batted very well to score 121/2 in its innings. 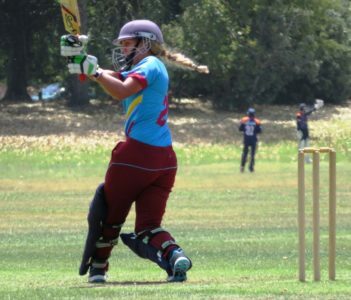 Rewa Arora scored a swash buckling 30 in 35 balls and she enjoyed an excellent partnership with Tash van Tilburg who unfortunately had to retire on 47 feeling unwell. However University had no trouble scoring the 122 runs needed in 15 overs. They are a good side and took advantage of tiring bowlers. The Marie Raos Ray White Premier Reserve Men had their second win in under two days. Playing away at Cornwall, Howick chose to field and rattled through Cornwall for 97 runs in only 34 overs. All the bowlers contributed well but left armer Mike Rose with 5/10 off six overs destroyed the opposition innings. Howick’s reply wasn’t all that inspiring when the score stood at 15/4 but eventually the innings was declared closed at180/9.Runs came from the middle order with Keiren Mackenzie scoring 30, Taine Jolley 46, Jamie Parker 40 and Michael Greenwood 34*. Cornwall fared no better in its second innings scoring a dismal 102. Rose 4/45 (giving him 9 wickets for the match) and Matt Blandford 4/38 dominated the bowling statistics and Howick scored the winning runs off only 7 balls finishing at 19/0 and winner by 10 wickets. The win has consolidated the sides place at the top of the table and they have another big match in their One Day Final on Waitangi Day at Lloyd Elsmore.